Arterion is an Altmer necromancer. 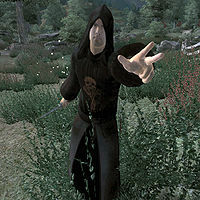 He is found in the High Pasture, west of Skingrad, where he only appears during the Mages Guild quest Ulterior Motives. Once the related quest is active he will immediately travel to his assigned location. After arriving he will simply stay in place until you appear. He wears the standard necromancer's robe and hood as well as a pair of thick cowhide shoes. His only other possession is a leveled amount of gold. In combat, he relies on an iron dagger and on a leveled set of necromancer spells. Esta página foi modificada pela última vez à(s) 15h32min de 26 de março de 2013.